Train Wrecks is back after a small break, and DJ Hyperactive is here to close out 2016 with Dustin. Chicago-based DJ/Producer Joseph Manumaleuna aka DJ Hyperactive needs little introduction to those versed in the history of techno. As one of Daft Punk’s “Teachers” and “brother of the humble” according to Resident Adviser, his contributions to the underground continue to span generations. 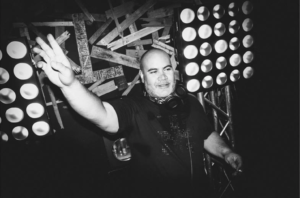 Also over the course of his career, he has produced over 100 remixes and original tracks, including classics such as ‘Venus’ & ‘Wide Open’ – Missile, ‘25HRs’ – Droid Recordings, “Music Box’ on his own imprint 4 Track Recordings, ‘Chicago’ – Contact, Truncate, Figure, Blank Code, Impact Mechanics, Nachstrom Schallplatten, CLR, to name a few. DJ Hyperactivereturned to Chicago 2013 to reconnect with his family and musical roots. His story continues with more gigs and more studio productions, with the difference being the experience and perspective that only a true veteran can possess.